This photo was taken at Calgary Zoo, Canada by zoo visitor Nancy Chow. The baby lowland gorilla, a six month old female name Yewande, decided to “chillax” after playing with her favorite pink blanket. Struck by Yewande’s pose, Chow took this picture. “When I took this shot I love it right away because the baby gorilla was so adorable, Yewande looks so human-like. It is easy to see how closely we are related to these great apes, Yewande’s pose could be any one of us taking a well-earned break. Except I don’t think I could do that with my feet”, said Chow. Read more on Telegraph: Baby gorilla pictured ‘relaxing’ in human-like pose. What a great photo. Thanks to my friend Kambiz for pointing it out that it’s blog-worthy. This photo also reminds me of what Dr. Frans de Waal said, “Contrary to general belief, humans imitate apes more than the reverse”. 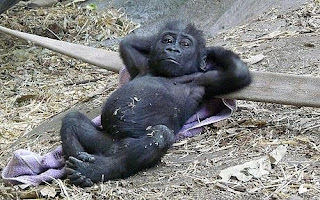 So, is this baby gorilla relaxing in human-like poseor are humans relaxing in ape-like pose? This is some great info! Keep it up! good photo!it has natural lightning anyhow..